One of the most important parts of a home is the driveway. It invites people in and coveys a lot about the state of a given home. It is therefore important to ensure that it’s in its best state. Whether you are renovating your driveway or constructing a new one, it is important that you go for quality and long-lasting designs and employ the right concrete contractor for the job. Many homeowners prefer using high-quality concrete material for commercial and residential driveways and walkways for various reasons. 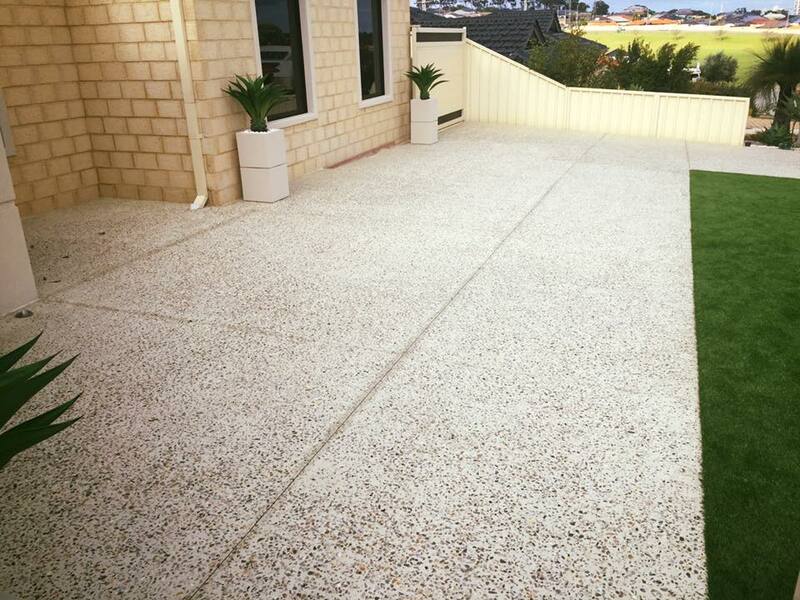 At Absolute Scapes, we have been providing concrete driveway services in Perth and the surrounding areas for over a decade now. We derive joy and satisfaction from delivering the ultimate services according to our client’s expectations. At Absolute Scapes, our mission is to ensure that each of our clients is satisfied with the results of our work. 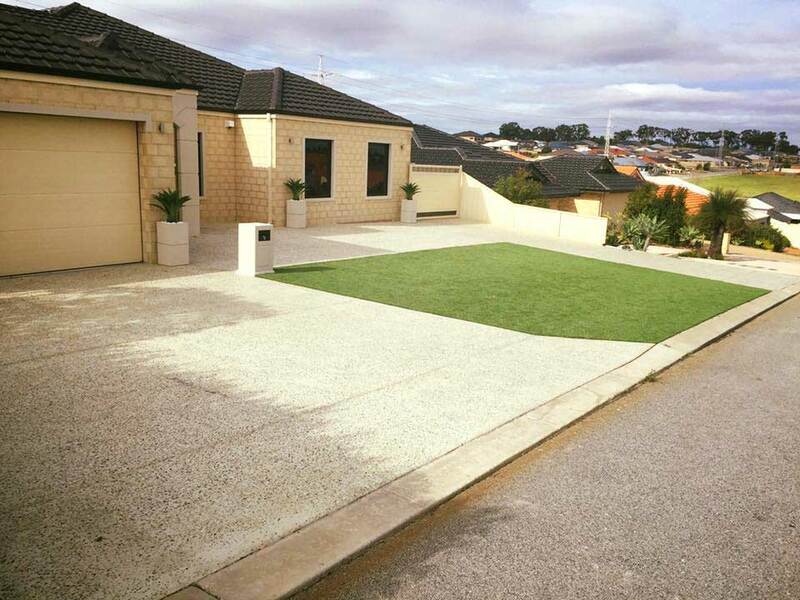 Looking to get your driveway in Perth built with concrete and modern finishes? Or maybe you just need a resurface using only the best ready mix concrete. Regardless, contact us today and we will be in touch. 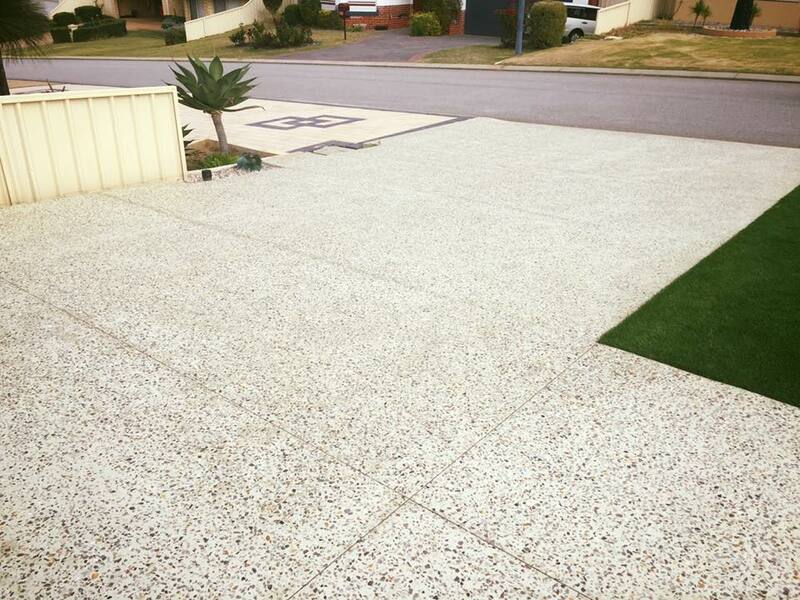 Why Absolute Scapes For Your Concrete Driveway in Perth? Being around for almost 15 years now, we are proud of the many designs and successful projects we have worked on which has allowed us to gather extensive knowledge in the field and deliver exactly what our clients are looking for. We are able to mix different concrete types to suit the needs of our clients and provide high-quality work. In addition to our professional team, Absolute Scales has taken this industry a notch higher by incorporating modern designs and concrete sealer materials to ensure the results obtained are impeccable. We also ensure that the materials utilized are of the highest quality thus providing our clients with unmatched results and wet look surface finish. Some of our finishes include high gloss, crushed stone, cobblestone, flagstone, waterproofing, edging overlays, acid stain and more. Absolute Scapes has an insatiable desire for exceptional but quality work. You can, therefore, rest assured that your driveway will be unlike any other with many unique features to supplement the look. We do not compromise on the quality of the work and ensure that your new driveway will withstand the test of time while maintaining its initial dazzling appearance. With a professionally done concrete driveway, Perth homes have the ability to make a statement and improve their curb appeal. Are you sick of having contractors who stall on projects and never quite finish them? Well at Absolute Scapes, we understand that time factor is very important to our clients. We, therefore, have a policy of ensuring that your work is completed within the timespan agreed. Depending on your budget and preference, you can have any type of driveway you want. Absolute Scapes offers honed, polished, decorative concrete and liquid limestone concrete allowing our clients to choose whichever design options please them. There is also the option of a free quote for clients who may be unsure about their home or work driveways. With our years of experience, we can do almost any driveway design inquired by the client and advise them on the best options in case the style inquired has some limitations. We also allow you to choose exposed aggregate floors of a colour of your choice and ensure you have the desired finishing for your driveway on time. We also provide honed concrete in Perth. Driveways are a vital part of our homes and so they should be of the highest quality. Trust Absolute Scapes, your concrete driveway Perth experts and you can rest assured that you will not be disappointed. A good quality concrete driveway made by qualified concrete contractors can last up to 30 years and beyond. To prolong their durability, homeowners should adopt appropriate maintenance practices. This makes finding the right paver and contractor important. Our team of qualified staff understands that a high-quality concrete slab plays a huge role in prolonging the lifespan of your concrete driveway. That’s why we utilize the best sealer materials there is in the market to give you value for your money while delivering an appealing finishing, ensuring there are no concrete cracks. Our concrete driveways don’t need lots of maintenance. However, you may want to conduct concrete resurfacing services using some of our best quality sealers to ensure they remain in clean condition over the years. You can do this on your own or you can have our team handle your paving for you. Our concrete driveways come with adequate versatility and stain in regards to appearance. This is because our team always use stamped concrete to create a variety of designs. You can even choose the colored concrete for added aesthetic appeal. When designing your concrete driveway, our team will need to understand the kind of vehicles you anticipate. If you anticipate heavy vehicles, for instance, you’ll need to have a robust concrete slab and concrete pavers on your driveway. At Absolute Scapes, we endeavor to deliver excellent services for every project we handle. Whether you need to repair your garage floor, sidewalk or walkway, we shall use the best quality materials in the industry to deliver the best services, We use accredited cement and slabs to reinforce your surfaces. We have been in the industry for many years through which we have carved a reputable record in the Perth region. Our clients have been with us all the way and according to the available reviews, they are confident with our work. Still, our client base has continued to grow rapidly beyond the Perth region which is a clear indication that we are some of the best brick pavers in the market. Technology is advancing and so are concrete materials. We have a team on the ground tasked with researching and establishing the latest concrete products in the market in a bid to improve service delivery of your concrete driveway in Perth.